Pad Woon Sen (Thai Glass Noodles) Made of… Sea Kelp?! Here’s a recipe that will appeal to fans of Thai food, paleo/low-carb eaters, people who want yet another delicious Thai-inspired use for Stokesberry Farm’s ground chicken and local tasty winter vegetables, or anyone who wants to try something new. 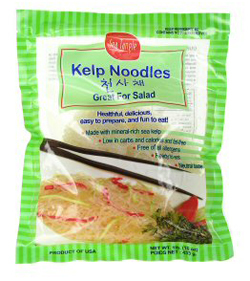 Not too long ago, I was shopping at Madison Market and saw something in the refrigerator case that caught my eye: a package of what looked like woon sen noodles, except they were actually kelp. I couldn’t resist; I bought them. Note that if your fridge is talking to you, you might want to start getting more sleep. I tasted a kelp noodle. It was a little crunchy. I was a little skeptical. But I was done with a deadline, and decided I’d cook this anyway. 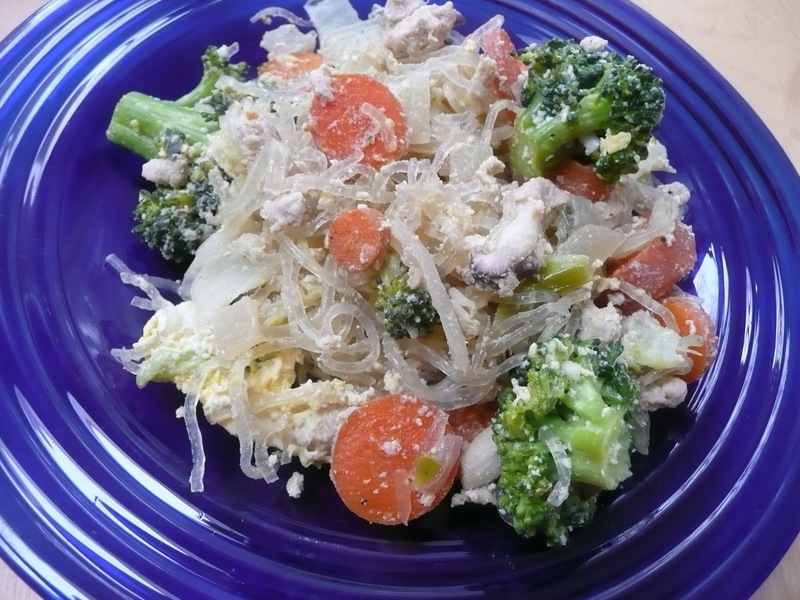 It only took a few minutes: Throw the garlic and onion in the wok, add some fish sauce (soy or other sauce optional), add carrots, cook till soft, add mushrooms… Cook in the chicken, add the broccoli and cabbage and noodles, add eggs and stir until cooked. Maybe ten minutes. Reader, I ate it. The kelp noodles lost their salad-like crunchiness in the wok. They were pretty much just like the regular woon sen noodles except less chewy (and woon sen is a little too chewy, if you ask me). The only thing is, these noodles are made pretty much of water, sodium, and calcium. True, they have almost no carbohydrate (1g) but they have almost no *anything* — which is to say you really want to make this dish with meat or something substantial, or you’re going to be hungry again pretty quickly. NB: This recipe is very approximate in ingredients and proportions. You can modify it to taste like any kind of stir-fry you like to make. Fish sauce is essential for Thai flavor, and spices or ginger make a nice addition. 1. In a wok, stir-fry onion and garlic in oil or fat. Add a few dashes of fish sauce. Add carrots and stir. 2. Add a bit more fat/oil and add mushrooms. Cook until they emit liquid. 3. Add ground chicken and any other flavors (ginger, hot chilis, etc) and stir until cooked. You can add the optional pinch of sugar at this point. 4. Add other vegetables and cook for a minute or so. 5. Add kelp noodles and a little more oil/fat. Stir to combine. 6. Make a hole near the bottom of the pan for two eggs, and crack eggs into it. Let them cook a minute undisturbed, then break them up with your spoon and stir them throughout. 7. Add lime or any other flavors (taste and adjust), stir, and serve hot. Chaco Canyon in the U-District serves kelp noodles, which I tried out of curiosity and absolutely adored. I still eat the regular old wheaty kind, but the kelp noodles are a lovely change of pace sometimes!